Restorative Justice for the Arts is proud to present a grassroots, community driven effort to bring life back to our Highland Park walls. This movement will be FOR the community, and BY the community. First, we will pledge our efforts and come together to help preserve, restore, and raise funds for endangered murals. 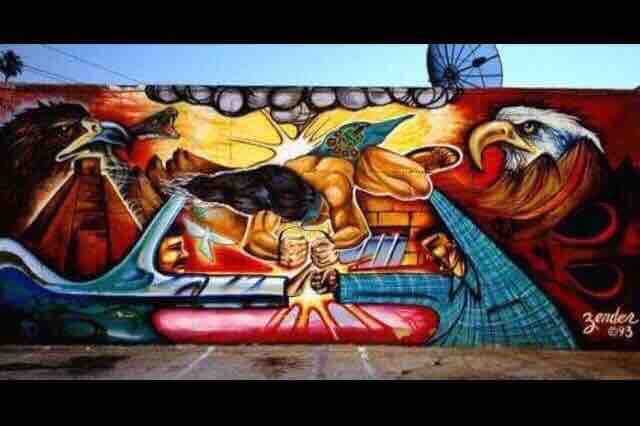 It is our collective goal to implement these same tactics to the rebirth of John “Zender” Estrada’s iconic Aztec Warrior mural, originally titled “Resist Violence With Peace" as well as the erased "Drive Thru Gallery" murals, and several others that were illegally white-washed. We want to empower our tight-knit community by inviting all of you to embark on this journey with us. Please help us to rebuild, preserve, and reintroduce these important cultural monuments back to their rightful place within our community. In Highland Park, our murals remain a matter of pride and direct link to our cultural identity. It is our collective hope that through the empowerment of our community and its artists, we will aid in healing the trauma and grief caused by these illegal erasures. Please donate what you can, and join the community in giving our walls some much overdue love, HLP style. Please help us by donating and/or sharing this on your social media outlets. We encourage contributions in all forms, including paint, volunteer time, and funds. All funds will go directly towards the restoration, preservation, and registration of these iconic murals, to ensure the protection needed so that these erasures will not happen again. We greatly appreciate your efforts and contributions.